Taking a Cat, Dog or Rabbit to College: Are Pet-Friendly Dorms Working? 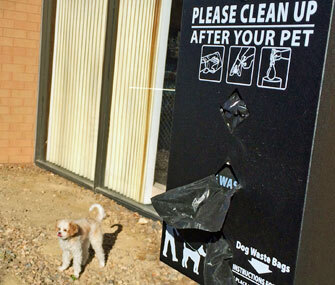 A dog named Kirby makes use of the pet waste area at the University of Northern Colorado. College students leaving the comfort and familiarity of home for the first time can experience a lonely and stressful transition, but a small number of schools across the nation are making this potentially difficult period easier by allowing students to bring their beloved pets to reside with them on campus. Schools such as MIT, Eckerd College, University of Washington and Stephens College have designated pet-friendly dorms where students can cohabitate with their furry family members. Upon seeing the success of these programs, the University of Northern Colorado (UNC) in Greeley launched a pet-friendly housing program in the fall of 2014. For UNC, the stakes for success are high. Enrollment is down, the university has lost 1,000 students in the past five years, and the university is looking for new ways to attract and retain students. Jenni Brundage, assistant director of Apartment Life and Operations, expects the program to be a great recruitment and retention tool: There is already a waiting list, and the university may add additional floors next year. Exactly why did UNC create the program? “We allow our live-in staff members to have pets, and a lot of students asked for pets themselves,” Brundage says. “We were getting an increasing number of applications for students to live with emotional support or therapy pets. There is a lot of off-campus housing that allows pets, and piloting this program opens the door for more students with pets to live on campus.” My practice, Sheep Draw Veterinary Hospital, serves as veterinary advisor for the program. In essence, we are the first line of care if the university has concerns about the care of the students’ pets. The hospital also provides education to students and staff about pet wellness and cares for many of the pets as patients. As a veterinarian, I was particularly curious about how this would work once the program began. 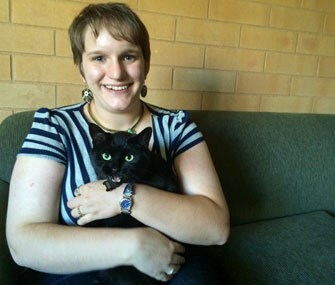 Student Sarah Hammer finds her cat, Robin, to be a great support. For now, the only pets in the program are cats and small dogs, none of whom weigh more than 40 pounds. The pets must stay in the apartments at all times, unless they’re coming or going from the dorm. It’s recommended — but not required— that pets be housebroken or litterbox trained. What’s more, all pets must be spayed or neutered, vaccinated against rabies, be registered in Weld County and be on a leash when out on campus. Finally, students are required to buy liability insurance, which costs about $15 a month. 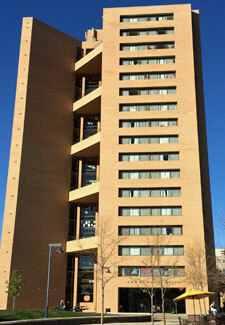 UNC's Lawrenson Hall has two floors that are pet friendly. To see how the program is progressing, we took a midsemester tour with Corey Friend, director of Lawrenson Hall.Friendis a pet lover himself and lives in the dorm with his dog, Kirby, a tiny, happy,fluff ball mix of Cavalier King Charles Spaniel and Bichon Frise. 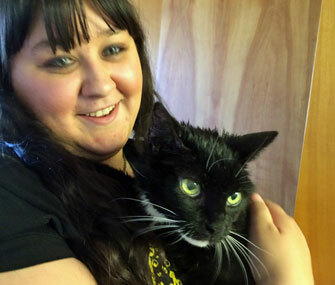 Morgan Monroe was thrilled that she could take her 17-year-old family cat, Bootsie, to school with her. UNC will promote the groundbreaking program at the regional college housing conference in November. If the enthusiasm of the staff and student participants and those on the waiting list is any indication, this program will continue to grow in popularity, and we may see similar programs extend to other universities.